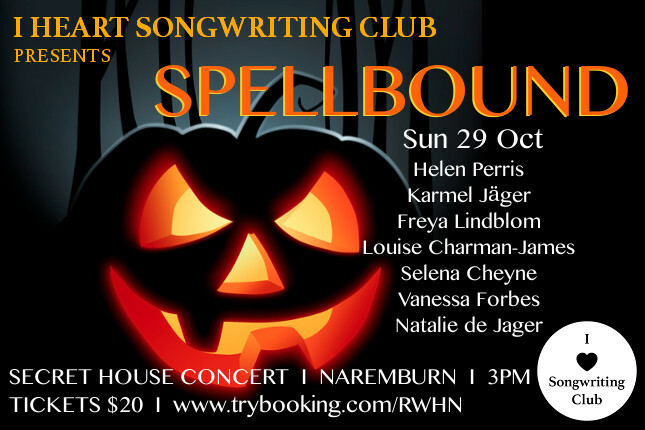 I Heart Songwriting Club presents SPELLBOUND: Halloween House Concerts (Bris + Syd), a total sensory experience as magic is weaved through songwriting in these two synchronised secret house concerts in Brisbane (The Gap) and Sydney (Naremburn). For this event we invite the public to join in the creative fun and dress to impress…or scare! Prizes will be on offer for the most creative costume. I Heart Songwriting Club is a global online community which aims to inspire, support and challenge songwriters as they develop their skills in a safe and inclusive environment. Over the past 3 years, the club has generated over 5000 songs from worldwide members including songwriters from Australia, UK, USA, Germany, Canada, New Zealand, Spain and Brazil. These songs are performed live at gigs, recorded on albums and are being played on radio. But importantly, these songs are changing people’s lives – in the making and sharing of these songs, with each other in the club and far beyond. Members who have written and released songs as part of I Heart Songwriting Club include Mama Kin Spender (WA + VIC), Sam Buckingham (NSW), Tash Parker (Vic), Lucy Peach (WA), Dave Crowe (NT) and founder Francesca de Valence (Qld). Previous post: Helen plays Adelaide for the first time ever!